This post comes courtesy of Marcela De Vivo, who approached me with interest in providing this blog's audience with some great new content. I'm glad she did, and hope she'll come back in the near future. In this article, she writes about using social media to help promote your eBook. Social media is an ideal way to find readers and engage existing fans of your work, and as a writer, you should have at least a few of the skills necessary to catch your reader’s eye; however, many writers struggle with using social media since it can feel somewhat different that writing in a traditional sense. Many writers also struggle with knowing where to start as social media and marketing really aren’t their realms of expertise. Taking the time to learn how to market and promote your eBook using social media sites can generate significant results and you could even find a fan base that you never would have connected with otherwise. The major social media sites, like Facebook and Twitter, are no-brainers for authors looking to promote their eBooks; however, there are more than two big social sites, and utilizing them all can give you access to more followers and potential readers. Social sites, like Tumblr, Instagram and even LinkedIn, can help boost your readership base and help you make beneficial contacts in the publishing industry. You might not see a personal blog as a great way to showcase your writing, but it really can be an incredible tool to help expose readers to your work and message. Of course, you don’t want to put all of your writing on your blog – just samples and teasers to entice people to continue following you and to buy your eBook. For the maximum benefit, consider writing pieces similar to your eBook for your blog. You can even use the same information and package it differently. Believe it or not, many authors already do this, and it can be an incredibly effective way to sell eBooks when combined with other efforts. If you do start a blog, it’s important to link to your social media pages regularly-- those are what you really want followers to tap into so that you can let them know about future work. So, you’re using Facebook, Twitter and every other social media site under the sun and you’ve setup your personal blog. You’re posting every day on your social sites and regularly contributing content to your blog. Are your efforts helping and really getting people to buy your eBook? To find out, you need to use tracking tools that can give you some idea. Certain tracking tools can be particularly helpful for this since they can actually monitor visitors, leads and real sales of your eBook all on one convenient, easy-to-understand dashboard. Using tracking tools, like Cyfe, can also help you find out if your social media efforts aren’t really working much at all – or at least not enough for the amount of time you spend on them. With this information, you can work on revising your social strategy until you get the results you want and need. Social media is important for all businesses in 2013, but it’s particularly important for independent businesses, like authors looking to sell eBooks without major backers and partners. While selling your eBook can seem like a very difficult task, especially if you don’t have a lot of money to spend on marketing, you should know that social media can really help. In fact, it’s one of the only tools that every business, big or small, uses to promote their product-- because it actually works! Marcela De Vivo is a freelance writer in Southern California whose writing specializes in web analytics, green website hosting, tech and marketing. As the owner of Gryffin Media, she uses a variety of social media platforms to reach a broader audience. I'm on Facebook. Actually, I've been on Facebook for a while, but only in a personal capacity. 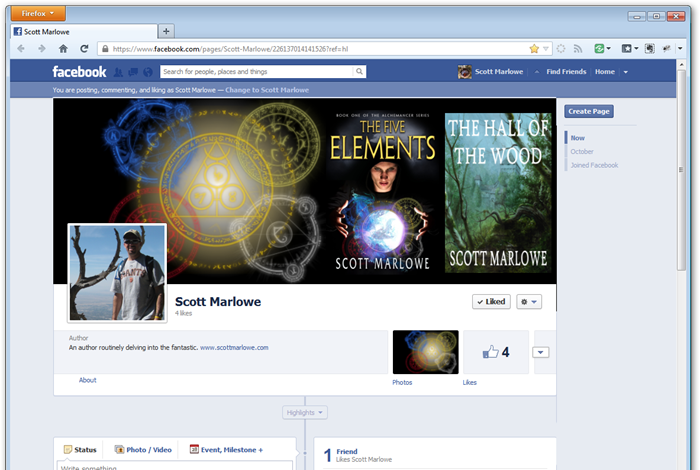 Now, I've got my very own Facebook fan page. The purpose of a Facebook fan page is to connect with, uh, fans. I plan to use mine mostly to share information about my books, sales, writing progress, and anything that's upcoming of note. You know, kind of like what most of us already use our blogs and Twitter for. There is a certain part of the population, though, who are exclusive to Facebook and could care less about the other major social media platforms nor are they necessarily blog readers. This in itself makes Facebook an important platform to have exposure on. That and their gazillion members. I actually created my Facebook fan page some time ago, but I wasn't doing anything with it. Expect that to change. I don't know if you're going to get any new insights or information out of it if you're already reading my blog or following me on Twitter, but if you do happen over I wouldn't complain if you decide to leave me a "like". You are a "social media expert"
I thought I'd turn that around and make the opposite conjecture: Why you're not following me back on Twitter. Here goes. 1. I don’t only tweet about one thing. I know some people maintain a singular focus on Twitter. Their “thing” might be sports, writing, tech, or finance. I actually tweet about all of those things and occasionally more. If you’re someone following me because you’re a fellow writer or a reader of my novels and I suddenly barrage you with baseball tweets (like I did during the playoffs and World Series when my San Francisco Giants won it all), then you might have unfollowed me. I can’t help it if I’m representing myself as a real person. Real people have many interests, so that’s what you get when you follow me. By this I mean any of those generally “taboo in the workplace” sorts of subjects like politics, religion, social views, etc. While I generally do not tweet topics related to these, sometimes one slips out. For example, someone recently tweeted something about gun control. This is one of those hot button issues here in the United States. People are typically on one side or the other with not much in between. I imagine my response to this person put off some people and maybe I lost some followers because of it. I know I’m not following that person anymore. For a little while there my feed turned into one product sales announcement after another. I still tweet out these things or direct thousands of Twitter followers to new posts on my blog, but I try to keep it toned down and, at worst, at least interspersed amongst other information. I don’t think I actually tweet that much, though I’ve been on the service for a while now and so I’m at around 16,000 tweets total. I tend to hit people in the morning and late evening. In between I’m working and actually find Twitter to be too much of a distraction. I’m very much of the tweet it and move on mentality. I don’t put questions or information out expecting replies or answers. I’m kind of this way on my blog as well. This is probably an area I could work on. I’m trying to be a good Twitter citizen by returning the RT love and such but I think in the past maybe I wasn’t too good with this. In fact, now I actively keep track of certain individuals just so I can return the favor more because they’ve been nice enough to help me out with a RT of my own stuff here and there. I’m sure there’s more reasons but why dwell on my failures? Let’s stay focused on the positive and sharing good information. When someone follows me on Twitter I want to follow them back. But I don't always do so. Here's a few reasons why. When someone sets up a new Twitter account the default avatar is an egg. The egg isn't there for long on most (legitimate) accounts, so it's a pretty sure bet that when a follower's avatar is still eggified that account is a spam account. When I see the egg, I don't follow back. I like to know there's a real person behind the Twitter account. Having a non-egg avatar is a good first step in determining this. Again, I like to see that I'm following back a real person who is making an honest effort on Twitter. Your bio can be short, it can be long, but it should tell me something about yourself. A bio full of hashtags… why, why, why? You can't see me, but I'm shaking my head just thinking about it. Same goes for people who jam 4 different shortened links into their bio. Sorry, but I'm not going to click on something with a bunch of nonsense characters in it, especially when I don't know you. A big part of Twitter is reciprocation. When I follow someone, it's because I've scanned their tweet stream and either been amused, entertained, or informed. If when I scan a tweet stream all I see are messages selling something—anything, really—you've just earned a no follow back from me. Indie writers are the worst about this. I sympathize with you all—I've got a couple of books to sell, too—but when my "All Friends" feed on TweetDeck is full of nothing but people selling, that starts to earn "no follow's". Retweets are fine with me. But like many indulgences, moderation is important. When I see someone's stream is nothing but RT's, most of which are trying to sell something, I pass on following back. 5. You are a "social media expert"
Excuse me, but WTF is a 'social media expert'? That's a rhetorical question which I really don't want to know the answer to, by the way. Social media expert = go away, please. I see this amongst the tech circles more so than elsewhere. Really, guys, get a (digital) room or pick up the phone. This doesn't usually garner an unfollow or 'no follow,' but it comes close sometimes. When I follow someone back I'm fine with someone thanking me via an auto direct message. But not when it exists solely to tell me about something I don't want to buy. Following someone is about initiating a relationship. Exercise some tact and don't try to jam something down my throat before we've even had a chance to exchange pleasantries. This is rude. People find you interesting enough to follow. Give at least some of them some consideration and follow them back. The other way this happens is someone will follow, follow, follow. Then when those people start following them back the person unfollows, unfollows, unfollows. I guess it makes people feel important when they have a ton of Twitter followers and only follow a few back. Whatever, loser. You'll notice I didn't call out any individuals above. I'm not pointing fingers, especially since I know I've been guilty of a few of those points myself. But I've moved on from, say, making my Twitter feed all about selling my eBooks. I get a lot of useful information from my followers and try to reciprocate as best I can. The key to success on getting a follow back from me (and most people, I think) is that old adage: just be yourself. The MA site serves two purposes: (1) it connects authors with other authors and (2) it gives fantasy readers a place to find some great, new reads. The proprietor of the site, Daniel Marvello, also organizes "reading tours" where authors help each other out with reviews and other promotional "stuff" (Twitter, etc.). This isn't an uncommon practice and there's no obligation to either read or, more importantly, review something, especially if as a reader/reviewer you find it's something that isn't working for you. The Summer 2012 Tour approaches. There was a previous Tour in the Spring of which I did not participate because I wasn't aware of the site at that time, but I'll happily jump into this one. I'm not entirely certain how the Tour will take shape, but you may wind up seeing some related posts here once things get going.